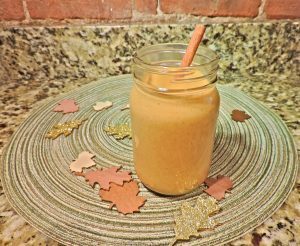 Chai Pumpkin Protein Smoothie – Be Healthy! My FAVORITE fall flavor is pumpkin, and I don’t just crave it in the fall, I crave it year round! 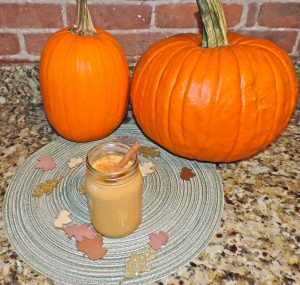 Since I can’t eat pumpkin pie all the time, I decided to whip up a delicious smoothie to keep my cravings at bay and fuel my body with vitamins and minerals. Pumpkin has many health benefits. It provides you with fiber, vitamins and minerals, like vitamin A. Fiber helps to keep your digestive system regular and vitamin A plays an important role in the formation and maintenance of the lungs and heart and supports a healthy immune system. Pumpkin also contains vitamin E, which protects your cells from free radicals, potassium, which assists with the function of your tissues, organs and cells and phosphorus, which helps with muscle contractions, kidney function and with formation of teeth and bones. 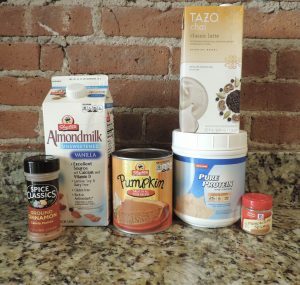 I use Unsweetened Vanilla Almond Milk and Tazo Chai Tea Concentrate as my liquids because it adds a low calorie hint of vanilla and chai which taste delicious mixed with the pumpkin puree. I use Pure Protein Vanilla protein powder for boost of protein because I enjoy the taste of this protein powder and it is also low in sugar. A bit of cinnamon and pumpkin pie spice give it just enough spice to make it taste just like pumpkin pie! Whip up this smoothie to start your morning off the right way and get all these health benefits and more!